Kyle Watkins with assistant Lori Borbely. Boston Town remain unbeaten in 2019 after drawing 1-1 at Lincolnshire rivals Holbeach United. 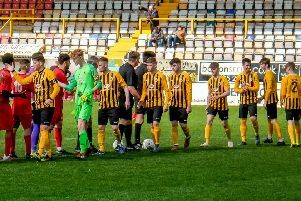 Gary Edgley had warned his Poachers not to underestimate the Tigers, who went into tonight’s clash at Carter’s Park on the back of seven straight UCL Premier wins. But Boston - themselves unbeaten in seven prior to kick off - held their hosts for the first half, before Kyle Watkins put Town ahead in the 59th minute. The lead lasted 18 minutes, Adam Jackson pulling the hosts level. But with no further goals honours were even.